Oh this was so cute! So cute! And Giovanna's writing style definitely seems to have come on between books - there's less exclamation marks and the writing just flows so well. SUCH a gorgeous little novella, so sweet and amazing, and oh God, I can't wait to dive in to Always With Love now!!! Sophie and Billy are just the cutest couple and this novella just made me die with happiness. Although I didn't read the novel that Giovanna wrote with the same protagonists, I still loved this book. Although I haven't read any other of the authors work, this one is still cute and quirky. The main characters are very sweet and you fall in love with them straight away. I'm not going to spoil it for you, but if you read it, you'll understand when I say you'll be rooting for billy in the book. So I give this a 4 star review. Because I didn't read the first book I can't give it the 5 stars, though I still loved this short story. Sweet and lovely little story. The Christmas feeling is coming off the pages.Just like the love for each other and family and friends. Of course I was also guessing who was the mysterious person who wanted to do a proposal at Christmas Eve. I wasn't disappointed by who it was. After reading Billy and Me, I wanted to get my hand on this short story that takes place after the end of the book and obviously, at Christmas. This little book maintains the charm of Billy and Me (and You're the One that I Want, Giovanna Fletcher sure know how to write charming novels and characters.) and adds a bit of mystery because someone wants to use Sophie's teashop to propose. It's not to difficult to figure out how is it but it's still cute and charming. I know, I'm using this word a lot but it's really the best suited word to describe Giovanna's writing. So, obviously, if you liked her other books, check this one out. It's just two quid, btw. And I can't wait for her next book, she is such a delight to read. Actually more like 3,5 stars, working with half stars would be so much handier.Anyway, turns out that my thoughts about what was going to happen were wrong. But it's still a very sweet and romantic story that left me with a warm heart and a big smile on my face.Also a great read on Christmas Eve, cause all I want to do now is sit around with my family and give them all big hugs. Very sweet. An amazing follow up of the characters in the original book , Billy and Me. The ending was cute and romantic, definitely shocked me. I think this shows how much we want and need a full length sequel. Por el casi final más tierno del mundo. Super short, easy read to lead into the next Billy and Sophie story. It was cute, but hopped immediately from event to event so there was no soft, peaceful Christmassy feel to it. It was a lot of tell, instead of show, in describing the actions of everyone as well as the settings. Saw the identity of the Proposer a mile off, but it was still sweet. The new characters are cute but I'm wondering how much they're going to tie in to the next book. Shall wait and see. Good little short, overall. A firm lover of Fletcher's light-hearted contemporary romances (and her husband's music! ), I was on-the-edge-of-my-seat excited to read this short spinoff story. Set a few months or so after the events of the first novel, Billy and Me, it's the perfect tie-off for their happily ever after. Or so I thought. I'm willing to put my hands up right now and own up to the fact I expected the proposal to be from a certain gorgeous movie star - except, it wasn't. Don't get me wrong though, I still love who The Proposer turned out to be and found the plot even more lovely than I expected!Usually I'm not in a festive mood until a week or so before Christmas but honestly, the magic this book radiates makes it almost impossible not to be itching to put your decorations and tinsel up already. It was just the little instigator I needed!Of course, my only criticism is the length. Personally I find it incredibly hard to read such short stories since it's so difficult to immerse myself back into Sophie's world. That being said, I do love Fletcher's writing style and I am beyond thrilled Sophie and Billy's story got to be continued.favourite parts: mulled wine. molly's-on-the-hill. christmas carols. pauline the angel. the proposal.least favourite parts: the length. lack of billy.would recommend to: people trying to get into the festive mood. lovers of billy and me. lovers of contemporary romance. me. This review was originally posted on Star Crossed Reviews I received this book for free I bought it in exchange for an honest review. This does not affect my opinion of the book or the content of my review.I purchased this book from Amazon quite a while ago but as soon as I finished Billy and Me I had to read Christmas with Billy and Me. 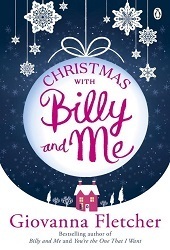 This book is set a few months after Billy and Me and if you haven’t read that then Please do not read on as there are some spoilers ahead…Sophie and Billy are happily running Molly-on-the-Hill and now it’s Sophie’s favourite time of year. This is the first Christmas without Molly and Sophie wants to make sure she’s doing her justice. So when she receives an email from an anonymous romantic wanting to propose in her teashop she had to say yes.I guessed who the couple was quite early but I this didn’t ruin the story at all. I loved all the effort that Sophie and the others put into making this proposal perfect.This is a sweet, romantic story with a dose of Christmas magic. Giovanna had me tearing up a few times. Giovanna’s character building is so well written that you feel like you know these characters as well as your own family.Christmas is my favourite time of year and I really enjoyed this novella. I am looking forward to reading Always with Love in the near future. Though it's not Christmas or even 'Christmas in July' - this book is still a beautiful love story and gets me ready for the new book!!! New Year in LA - yes please XDFirst Read: December 2014Yet another beautiful, romantic story from Gi Fletcher!! 'Life presents us with a series of patches, and from those little patches great things are made. 'The story sees us return to Molly's on the Hill at Christmas time. Six months have passed since the reopening of the tea shop, and Sophie and Billy have been approached with a secret proposal plan. The 40-page novella is filled with all the charm and beauty of 'Billy and Me' - a very enjoyable read for those who loved the book! I loved this so much! I adored the original novel 'Billy & Me' and was so excited when Gi announced this was coming out. I was a bit disappointed that it wasn't longer and was hoping Billy was going to be the Proposer, but I loved it all the same and I'm hoping there'll be more follow up novels and that we'll eventually get a Billy and Sophie wedding! Was so lovely to catch up with these characters at Christmas time. Billy and Sophie still madly in love and happy. The surprise Christmas proposal was brilliant and sounds like the ideal way to be proposed to if you ask me. A lovely little read!! i absolutely loved this one. there is just something that i love about sophie and billy, but when you add christmas im melting with the cuteness. this got me so into the christmas spirit even when it's only november! i will probably be rereading this closer to christmas. The only Bad thing I can say about Christmas with Billy and Me is that it is too short. I want more! Come on Giovanna,please write more stuff! A beautiful quick read. Left me wanting more from Giovanna Fletcher; can't wait for the next book! This little short story was so enjoyable and heart warming to read. It left me smiling and was a lovely extension of Billy and Me !! Was not very impressed with this one unfortunately, as you might be able to tell from the rating. Although the wintery, Christmas descriptions were nice and atmospheric, plot-wise I felt that this little novella was lacking. I could see the twist, if you can call it that, coming from a mile off and I thought the delivery was lacking slightly.To round up my issue with it: I didn't get that warm, fuzzy feeling inside that I did when I read Fletcher's "You're the One That I Want" and have been craving from her since. Maybe I'm being too harsh as it is such a small book and so not really a fully fledged novel but I just feel like I could have spent my Christmassy evenings reading something with a bit more festive oomph. i gotta say this was the most adorable/christmasy short story i've ever read (in may no less), aaah it was so cute! especially with that reveal! so wonderful (although ngl i genuinely thought billy was gonna propose but alas, it was colin!) i've just started reading Always with Love and i'm so excited to continue (schoolwork is overrated anyways), adios then. Very SweetThis was a cute little Christmas novella. Though slightly predictable, it makes you feel warm and cozy. The perfect addition to the Billy and Me series. Short but sweetomance, festive a fab short story to get you in the mood for Christmas. Giovanna clearly loves Christmas and romance. This book was 4.5 stars.Throughly enjoyed but was predictable which is why it isn't 5 stars. The best book i've readAmazingly beautiful. This novela and the book just make you do engrossed and find it really hard to put it down. Giovanna Fletcher is the best author in my opinion. Giovanna Fletcher - Giovanna grew up in Essex with her Italian dad Mario, mum Kim, big sister Giorgina and little brother Mario, and spent most of her childhood talking to herself (it seems no one wanted to listen) or reading books.At thirteen she left Essex behind to attend the full-time Sylvia Young Theatre School, where she met her husband Tom Fletcher. Following SYTS she completed an acting BA (hons) at Rose Bruford – since then she's been acting, chaperoning mini actors and dabbling in a spot of freelance journalism.Giovanna is a firm believer in the power of magpies and positive energy. To see what makes Giovanna smile, view her blog at giovannasworld, or her Twitter page @mrsgifletcherBilly and Me is Giovanna's debut novel.